Buy Williams Bon Cretien pear trees for sale online FREE DELIVERY from UK suppliers of garden fruit trees. BARE ROOT Williams Bon Chretien Pear Tree. Click The Link For Containerised Williams Bon Chretien. A pear that has been enjoyed since the seventeen hundreds, not that we know anyone to ask them directly about that but those history people seem convinced it was so. In fact it is so good, the RHS have given it an award. This will be because it is juicy, sweet, an early and good cropper with medium to large size pears. Williams Bon Chretien pears are a pale green colour turning an attractive golden yellow. 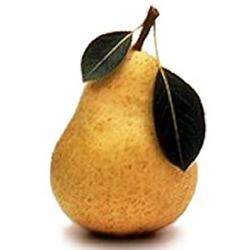 Self-fertile/Not self-fertile: This pear is not self-fertile so it is necessary to have another pear for pollination to provide pears. This pear is in flowering period is C3. To make it easy to match this pear with a suitable pollination partner we have used a series of codes, which are C1, C2, C3, C4 and C5 and relate to flowering periods. Every pear variety we sell will have one of these codes. The code we have given this pear tree means that you need to find another pear with the same code or one less or one more, so for example, if the pear is code C4, then another pear variety with code C3 or C5 would be suitable to act as a reliable pollination partner. This ensures the pear flowers of both trees are open at the same time. Maximum pollination will occur when buying two pears of the same number.